You wanna talk slow cookers? Let’s talk slow cookers! Hamilton Beach has several excellent models and these 3 are their best. I’ve put together a handy quick reference chart to help you choose to the right one for your home. Keep scrolling down for more detailed info on each as well as pricing. These are the best deals online and I update them every day. Don’t forget to keep scrolling to see my TOP PICK and full report on it. Here’s a closer look at each with some of today’s pricing included. 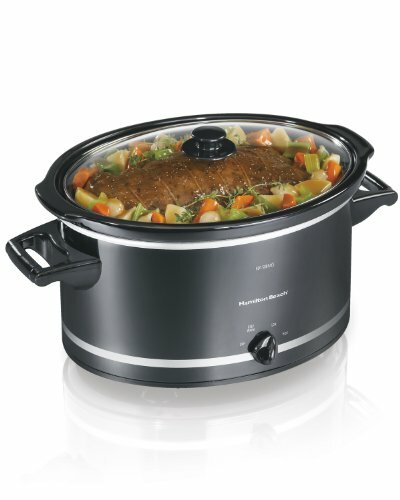 What’s not to love about the Hamilton Beach Set ‘n Forget Programmable Slow Cooker? 6 quart capacity, locking lid for transport, and 30 minute cook time intervals. The thermometer probe gives you precise readings to know the doneness of your food. FREE SHIPPING! Take the guess work out of slow cooking with the more precise control of this model. Sized and shaped to fit a 4-lb roast or 6-lb chicken. Perfect for large meals. It's the ideal size for a 6-lb roast or 8-lb chicken. Features full grip handles, mess free lid, and stoneware and glass lid are dishwasher safe. NICE PRICE! GREAT CUSTOMER SERVICE! The perfect transportable slow cooker for smaller meals than the bigger units are designed for. The oval shape is perfect for a 4lb chicken or 2lb roast. 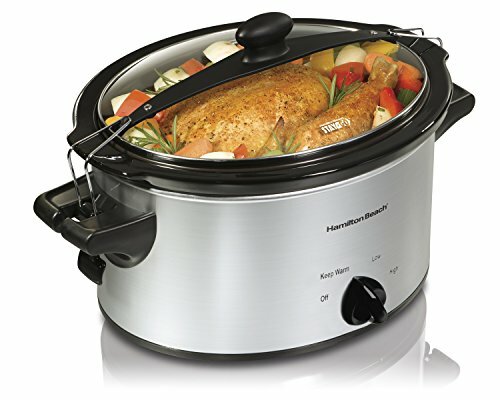 The Hamilton Beach Set ‘n Forget Programmable Slow Cooker, 6-Quart is a well designed, well made, and well priced unit. It covers all the bases and even has a coupe of extra bells and whistles. Along with performing the basic function of turning out ridiculously succulent slow cooker recipes, it has a temperature probe to help you get the best results possible. The locking lid gives it portability. Considering the modest price it sells for I suggest you scroll down to read my full report. As always, you can count on me to find the best price online. This specific deal on Amazon has the competition beat cold again, folks, so click here to get it. I’ve also added a few smart suggestions to go with your new favorite kitchen appliance. One of the nice things about slow cooker as a technique is the simplicity. You put the stuff in the pot, turn it on, then come home a few hours later to the delicious aroma that usually comes from hours spent slaving over a hot oven – but with virtually none of the effort! It’s not supposed to be complicated and the Hamilton Beach Set ‘n Forget Programmable Slow Cooker, 6-Quart delivers on that promise. Check out this video. It’s a super quick demo of how this slow cooker works and some if its special features. 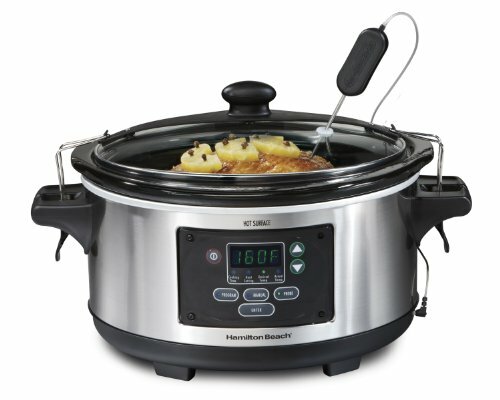 Like most similar units the Hamilton Beach Set ‘n Forget Programmable Slow Cooker, 6-Quart has a digital display. It’s very easy to read and simply laid out. The unit has It features 3 cook settings – program, probe and manual. You can program your cooking time and when it’s done, it will automatically switch to “keep warm”. You can also get the perfect doneness on a large cut of meat by using the probe setting. Just set the temperature you want for doneness, insert the probe, and it will cook until that temperature is reached. After that, it switches to “keep warm” mode. Lastly, there manual. You just choose the high, low, or warm temperature setting and turn it off whenever you’re ready. Very nice alternatives. The probe itself will always display the temperature of the food it’s inserted into. The cooker’s temperature is displayed on the control panel. With that in mind, if I had an improvement to offer I’d say the temperature probe could be a little longer. You can always adjust for length, but you can’t if it’s too short. Many people ask about slow cookers having a delayed start function. This one does not and you won’t typically find that they do. It’s a food safety issue as leaving certain food products like meat at room temperature for a long time can create a breeding ground for bacteria. Cooking times start at 30 minutes and go up in 30 minute increments up to 12 hours. Here’s an important note: DO NOT lock the lid during cooking. That’s only to seal the unit when you’re transporting food. If you seal the wire locks, the steam inside will build up pressure and need to release. That will likely result in a mess and possibly injury. I must admit they’ve done a nice job here. The Hamilton Beach Set ‘n Forget Programmable Slow Cooker has got clips that keep the lid securely fastened when you’re moving it around. Sure, if you go nuts with it you might get some spills, but it’s not just gonna pop open on you for no good reason. The handles are ok but, from a portability point of view, they could be larger. Keep in mind that the outside of the base gets hot during use. You’ll want to be careful when transporting. This is not a “cool to the touch” unit. 6 quart It would be fair to estimate that it can handle a 6 pound chicken or a 4 pound roast. There are smaller slow cookers out there but I really don’t see the point. This will make a meal for 4 with leftovers or a nice batch of chili or tomato sauce that can be frozen for later. This size allows for much more versatility. Here’s a look at a pretty impressive chicken. Anyone in the mood for a nice roast? The crock grazed ceramic that’s dishwasher safe. I wouldn’t use anything abrasive on it as that might damage the surface. Clean the base with a damp soft cloth then wipe clean and dry. Manual that includes chart for probe cooking times. Hamilton Beach Set ‘n Forget Programmable Slow Cooker comes with a 1 year limited warranty that covers defects in material and workmanship. Hamilton Beach has a good reputation when it comes to customer service, too. This is an excellent basic slow cooker. It has the added bonus of a temperature probe – a nice feature that’s more of a reassurance to those new to slow cooking than seasoned veterans. The 6 quart capacity will make a decent sized portion and its locking lid ups its game by making it travel friendly. The fact that it’s reasonably priced makes it a smart kitchen addition.